Before last night, I had never even tasted a sweet potato biscuit. But they’ve been on my list of new foods to try for a few months now. 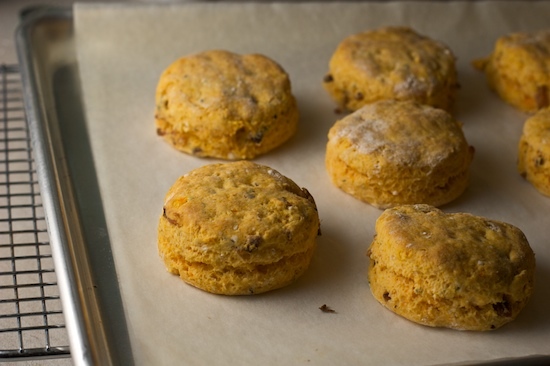 I’ve been collecting links to sweet potato biscuit recipes and have noticed that there is a pretty wide range of recipes. Some people make a very sweet biscuit, using lots of mashed sweet potato and sugar. My husband, who has a major sweet tooth, would love this version from Pots on the Stove. While others seem to prefer just a slightly sweet, buttery version, like these from Orangette. The inspiration actually struck when I was relaxing in the bath yesterday. Yes, I know, that’s kind of weird. But it’s true. I was laying there, trying to soak away the last of the lingering tension left over from what we all have to admit was a pretty stressful election year, and all of a sudden the idea popped into my head. Sweet potatoes, fresh herbs, and bacon! In a biscuit! Although at first it seemed to just magically appear out nowhere, I quickly realized where I got the inspiration. My friend Amanda has been experimenting with prosciutto and herb-wrapped baby sweet potatoes and I was lucky enough to taste them a couple weeks back. That woman is a genius! And this photo of her latest version made me start thinking of them again. And looking at that photo again last night, I almost threw some crumbled blue cheese in the biscuits. Now this is one of those recipes that is pretty much fool-proof. You can toss the bacon and herbs into any sweet potato recipe you like, but I went the easy route. I decided to make them using Bisquick, because it’s always nice to have a few Bisquick recipes! I decided to use only a small amount of sweet potato in these. I just wanted that little something extra while still somewhat maintaining the texture of a regular biscuit. I also only added a touch of sugar. I wanted to enhance the natural sweetness of the potato without actually making the biscuits sweet. Does that even make sense? They turned out to be just the way I wanted. A tiny bit sweet, slightly salty and smoky from the bacon, and the fresh thyme adds that extra dimension to set these apart from anything you would expect to come from a yellow cardboard box. I love them! And I can’t wait for one of you to try this recipe. I’m home alone for a few days so I haven’t even had feedback from my husband yet. Although I am driving up to my sister’s house today to deliver the leftovers to my brother-in-law. I’m pretty sure these will be right up his alley. 1. Preheat oven to 450 degrees and line a baking sheet with parchment paper. Dust a counter top lightly with flour. 2. 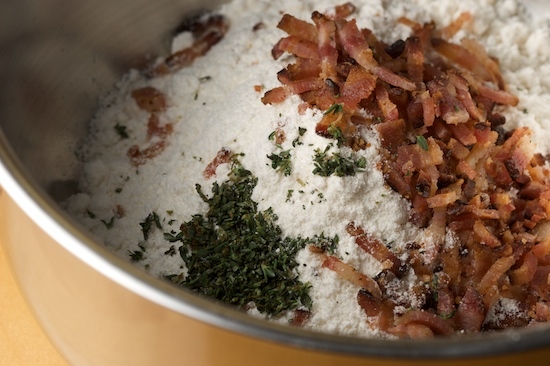 In a medium bowl, combine baking mix, bacon, and chopped thyme. 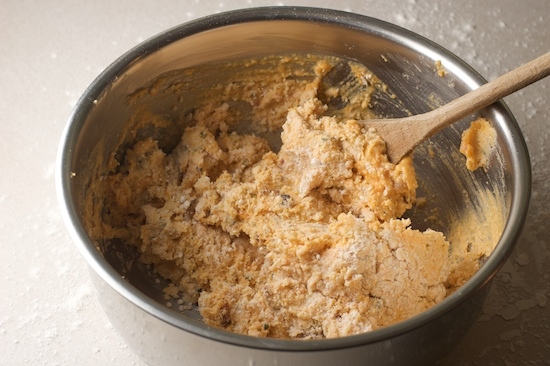 In a separate bowl, whisk together the sweet potato, milk, and brown sugar. 3. Pour wet mixture into dry mixture and stir until just combined. 4. 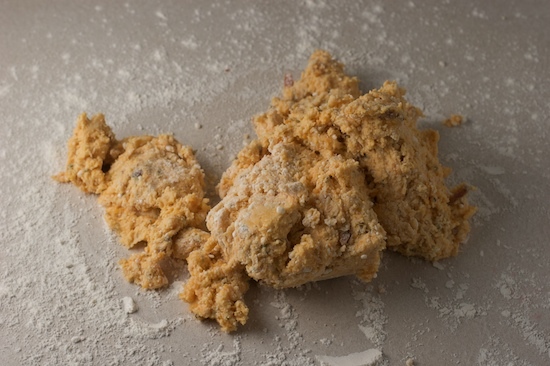 Dump mixture out onto a floured counter and knead a few times just to finish mixing the dough. 5. Pat out into a circle about 1/2 inch thick. 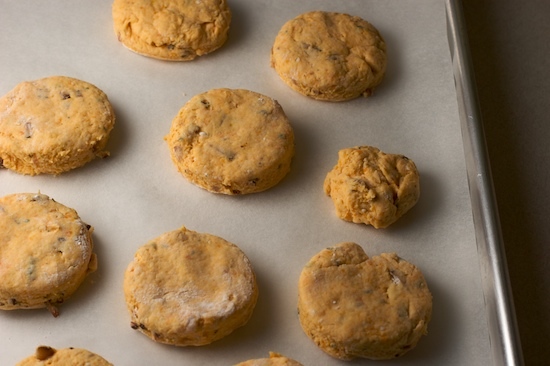 Cut biscuits and arrange them on a parchment-lined baking sheet. 6. Bake at 450 degrees for 8 – 10 minutes until just lightly browned on top. 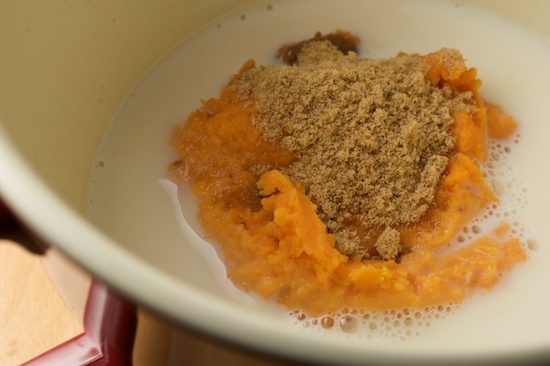 In a separate bowl, combine sweet potato, milk, and brown sugar. 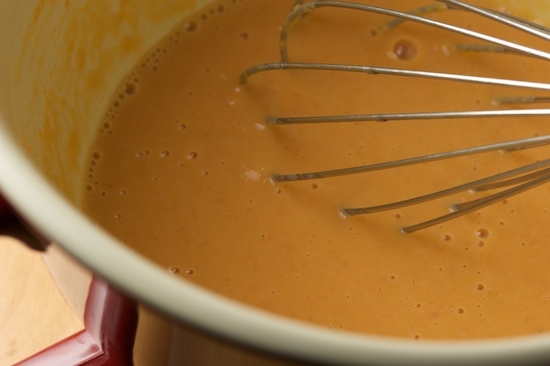 Whisk together the sweet potato, milk, and brown sugar. 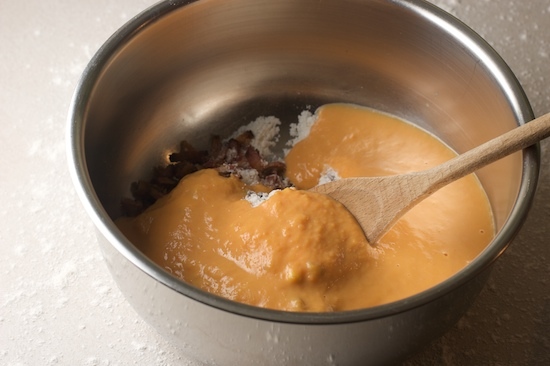 Pour the wet ingredients into the bowl with the dry ingredients and stir to combine. Stir until the dough just barely comes together. Dump the dough out onto the floured counter. 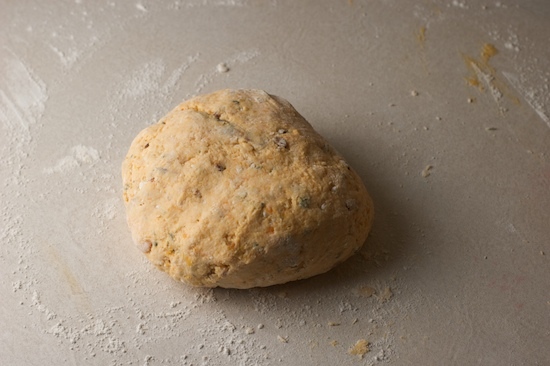 Knead the dough just a few times until it’s completely combined. Don’t overwork the dough! 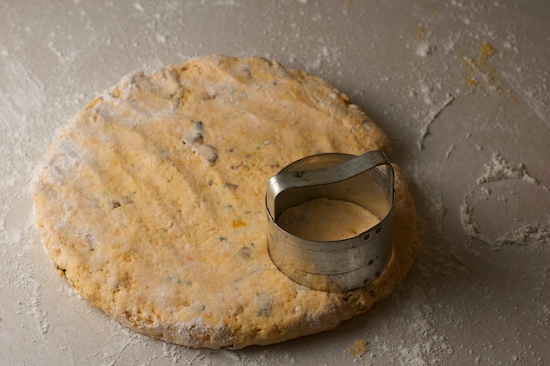 With your hands, gently pat the dough out into a circle, about 1/2 inch thick. Cut biscuits with biscuit cutter. Mine is 2 1/2 inches wide. 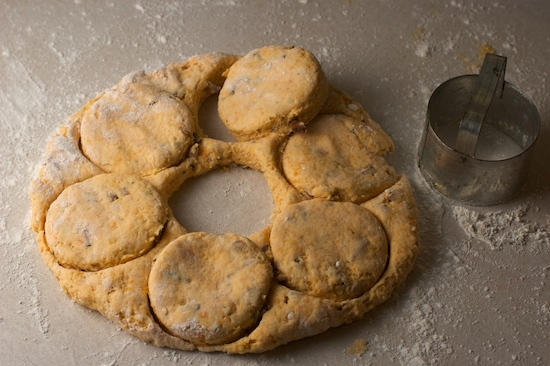 Combine scraps of dough to cut an extra biscuit or two. The final scraps can be shaped to form an extra tiny biscuit. 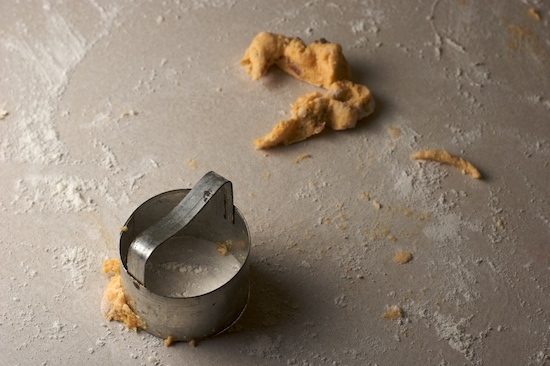 Place biscuits on parchment-lined baking sheet. You can see my tiny scrappy biscuit on the right! 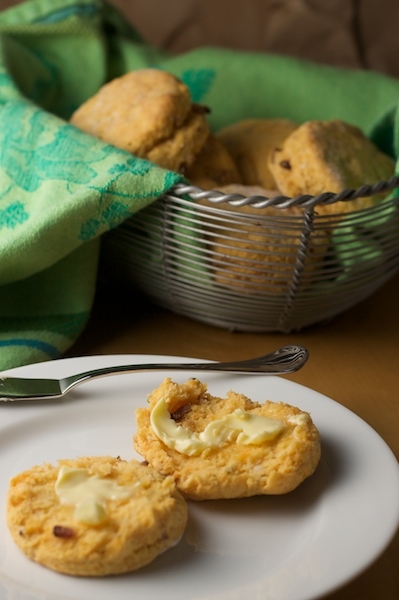 Remove the biscuits from oven when they are just barely starting to brown on top. 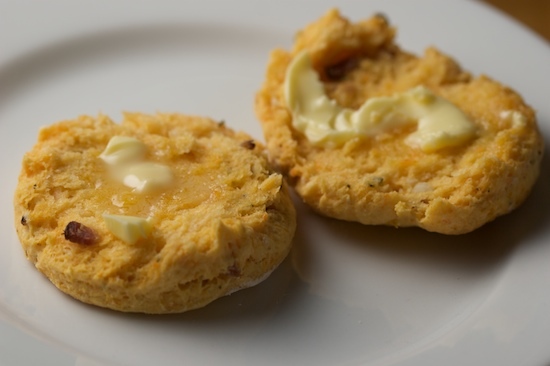 And finally, enjoy a biscuit warm from the oven with a bit of butter! For those of you just tuning in this month, I’m happy to say that I’m participating in the National Blog Posting Month challenge. For this year’s edition of NaBloPoMo, I’ve pledged to post a new recipe every single day for the month of November. If you don’t want to miss a recipe, sign up to receive my recipes by e-mail. You’ll only receive an e-mail when I write a new blog post, and your e-mail address will not be used for any other purpose. Interested? Sign up now! To die for! These look fabulous, butter....bacon...sweet potato, what a combo! Lunch. NOW. Your house. I'm on my way. WOW! My mouth was literally watering while viewing the photos. What a perfect November recipe. Wow- beautiful, Nicole. I've been craving sweet potato biscuits. And your addition of bacon is beyond! I'll be attempting these- gluten-free, of course. And as for the bath inspiration? Me too. My best creative intuitions and problem solving happen in the bath or shower. Ha. Go figure. Really lovely post Nicole! Where are your fab dish towels from? I'm all about the kitchen accessory. Ruby: I know, they're so good! Alanna: Wish you had been here last night to eat a few right out of the oven! Jamie: Thanks! If your mouth was watering, then I've done what I set out to do! :-) Karina: Please let me know how the gluten-free version turns out. I'm sure my sister-in-law would love to try them! Erin: Thanks! I'm sorry to tell you that those gorgeous dish towels came from Sicily. They don't absorb water well, so I don't use them often. But they're perfect for a bread basket. You can't really see in the photo, but they have artichokes on them. wow, those look so warm and comforting! amazing. Those would be awesome with a pot of beans! I love your biscuit cutter~ there has to be a story behind that! kickpleat: Thanks! Nat: Haha! Hope you didn't ruin it ;-) ttfn300: :-) Sandi: Not too much of a story, just that I've had it for a really long time! It looks older than it actually is because my husband's put it in the dishwasher and it's rusted in spots. He'll learn one of these days, haha! Fit Bottomed Girls: Wow, I've never heard of pumpkin biscuits. I wonder if they're similar in taste... Ashley: Thanks! Hope you get a chance to try them! I have bookmarked this because it looks SO wonderful! I am a big fan of sweet potato and they're all over the markets right now. Yum! I'm sending this recipe, along with some thyme from my garden, to my friend Lucia, who is the best biscuit maker I know and who has promised to teach me her secrets! Mayb e she'll add this to her repertoire. look at that color! that is totally awesome. this recipe seems so versatile and perfect for this time of year. yummy! I've been contemplating trying a sweet potato biscuit also. Thanks for the great idea of the bacon...I agree everything is better with bacon. Oh delicious! Everything *is* better with bacon! I will definitely be trying these. 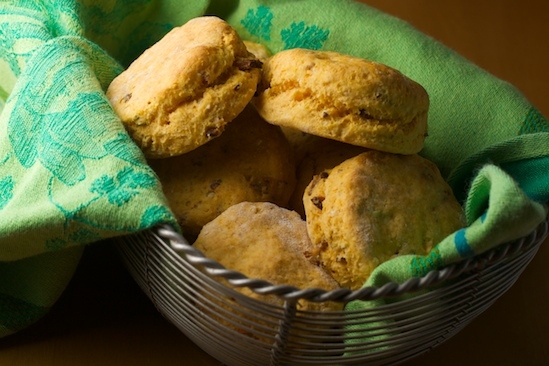 i just made these with bisquick lite and skim milk...I also added traditional sweet potato spices--eliminated bacon and thyme---because i want to serve them with kite country ham--a sugar cured ham--maybe even put a liitle apple butter--these might be great for Christmas gifts! thanks for the inspiration. I made these this week, and OH MY! They were delicious! I was afraid I had messed the dough up somehow, because mine was really, really wet and sticky and there was no way I could pat it into a nice circle and cut out the biscuits like you show above. So I did what my mom used to do with Bisquick biscuits - I just dropped spoonfuls onto the baking sheet and baked them that way. Worked out perfectly! I'm literally stuffing one in my mouth as I type! These are fantastic! I made them today as a test run for Christmas. They are perfect and I can't wait to eat them alongside all the other traditional foods. I did have a similar issue as the poster above with the stickiness, but I just added more and more flour as I went. But I guess I could try to just do the drop style instead of rolling them out. Either way I know they are delicious. Buon Natale! I just found your website yesterday while googling for biscuit recipes. I made this recipe this morning. I am in LOVE. It is incredible!!! My husband told me it's the best brunch I've ever ever made. hehe. :) Thanks! Love, Love, Love, this website, "Pinch My Salt" is my "New Best Friend" I have already picked items that I will be preparing soon. LOVE IT!!!!!!! Thank you!! can you give me some recipe of biscuits that is made of tofu? and how long it will last ? ( biscuits ) i will send it to my friend which i promise her when i learned how to make biscuits.she's from USA and i am here in the philippines.can you give me biscuits recipe that will last until a month.till she have the product so she can taste it?.kindly send me 1-2 recipe.okey? thanks. You really make it seem so easy along with your presentation however I in finding this topic to be really one thing that I think I might by no means understand. It kind of feels too complicated and very large for me. I'm taking a look ahead to your subsequent publish, I will attempt to get the hold of it! this looks so appetizing! I want to try it!! Hey girl! Thanks for giving me a shout out here! I'm 6 years late seeing this I guess. Or just brain fried. Now I make them gluten free!